The streets between Brick Lane and Commercial Street were dirty and narrow and filled with lodging houses of the meanest kind where a bed could be obtained for fourpence a night, or eight pence for a double. There was little in the way of privacy, the beds were crammed in together, separated into rooms by partitions which reached neither floor nor ceiling. The bedding was changed once a week no matter how many different people occupied the bed during the week, and the level of cleanliness was otherwise low. One of these streets was Thrawl Street. The photo shows the current road which goes by that name, which does not follow exactly the line of the old road, but quite close to it. The lodging houses were regulated, after a fashion, and the landlords were expected to keep good order. During the night a "deputy" would be on duty, and usually a watchman. The deputy would often know his regular clients and try to keep their beds for them where possible, but the life of a lodging-house dweller was irregular and itinerant. Very few of the houses would allow a bed to go on credit, if you didn't have the money in hand then you couldn't stay, but Edward Hoare tells us, writing in 1888, that "a regular frequenter of a lodging-house would be often allowed to sit by the kitchen fire till one o'clock, even if he had not the fourpence to pay for his lodging." One ofthe rules of the lodging houses was that unmarried couples were not supposed to be allowed to occupy a bed together. In practice this was not generally the case, but the more regular houses would ensure that beds were only shared by couples who regularly stayed together. A woman would not be allowed to bring a different man into her bed every night. Some houses did allow this, however, and these were essentially known as glorified brothels. One such was The White House, at 56 Flower and Dean Street, where Polly Nichols had spent the previous eight to ten nights before the night of her murder. 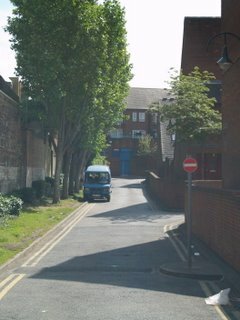 However, on leaving the Frying Pan pub that night she did not return to this lodging house, but rather to number 18 Thrawl Street, which would be on the right hand side of the road in the picture, where she had been living previous to this, sharing a room with three other women, one of them one Emily Holland. On arriving at the house Polly settled down in the kitchen despite the fact that she had not the money to pay for a bed for the night. She arrived at around half past midnight, and remained there until somewhere around twenty past one, when she was told by the deputy that she would have to leave. Excellent work! As an inhabitant of a country on the wrong side of the Atlantic, I'm at a severe disadvantage when visualising the geometry of Whitechapel. I finally had the pleasure of visiting it last month, but only located the five canonical murder sites - darkness was approaching, and I had no reference material with me, so I couldn't locate other interesting places there. Your site really makes the rest of 1888 Whitechapel memorable and vivid. Thanks!